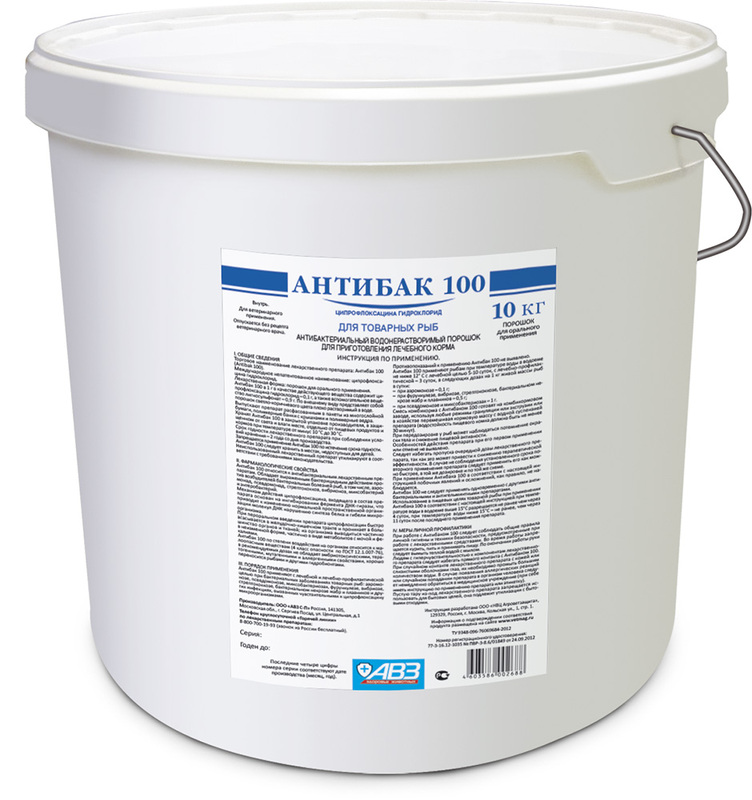 For industrial manufacturing of medical antibacterial feed for all types of fish. 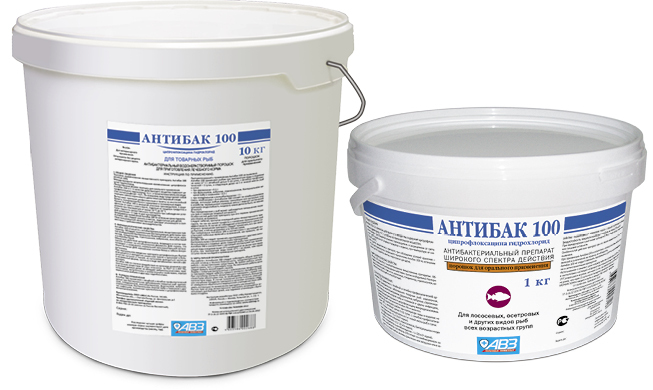 10 kg and 1 kg polymeric buckets. Treats and prevents main fish bacterial infections. Nonredundant product for adjunctive therapy of non-infectious, viral, fungal and invasion fish diseases complicated by bacterial infections. Non water-soluble and administered with feed. Antibacterial drug for fish of all types and ages containing non water-soluble ciprofloxacin hydrochloride (0.1 g per 1 g of powder) and excipients. Ciprofloxacin has harmful effect on all bacteria causing fish diseases. Excipients increase ciprofloxacin bioavailability and steadily bind the drug with granulated feed enhancing granule water resistance. Treatment and prevention of bacterial infections caused by microorganisms susceptible to ciprofloxacin (including agents of aeromonosis, pseudomonosis, mixobacteriosis, furunculosis, enterobacteriosis, bacterial haemorrhagic septicemia, mycobacteriosis and streptococcosis). Also it is used as a part of adjunctive therapy of non-infectious, viral, fungal and invasion fish diseases complicated by bacterial infections. • pseudomonosis and mixobacteriosis - 1 g.
Mixture of feed stuff and Antibak 100 is prepared in feed stuff factory (using any modes of granulation or extrusion) or in farm (mixture of feed mass and aqueous drug suspension); water resistance of food bolus must be ≥30 minutes. 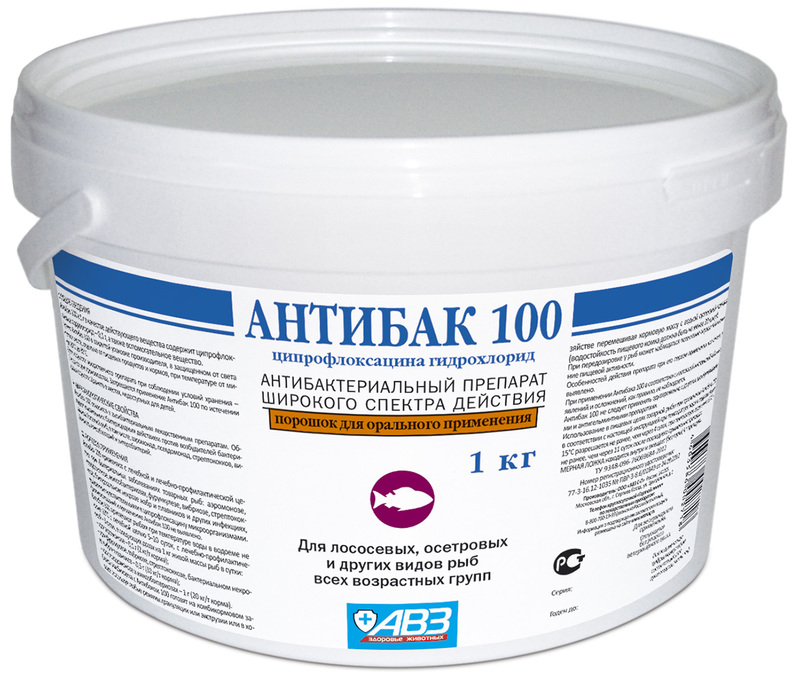 Commercial fish can be caught and eaten in 4 days (water temperature >15°С) or 11 days (water temperature <15°С) after the last drug administration. In order to prepare medical feed mix, it is recommended to use mixers which are capable to administer premixes (0.1-0.2%) providing equal drug distribution in mixture. Granulation and extrusion of medical feed mix do not influence on medical and preventive activity. Overdose: potential body blackening and decreased food activity. Store in original package at -10…+30°С. Protect from light and moisture. Keep out of the reach of children and animals. Shelf life is 2 years from manufacturing date.